The unabated killings in Kashmir sparked multiple protests across Valley for the consecutive day on Tuesday.Kashmir Bar Association took out a march from High Court to Jahangir Chowk Flyover. The march was led by president High Court Bar Association Mian Abdul Qayoom. Scores of lawyers participated in the march. While talking to reporters, Mian Abdul Qayoom said that it is in the interest of India to resolve Kashmir issue. “Both Pakistan and India will live happily and peace will prevail in sub-continent if these countries will resolve long pending Kashmir issue,” he said.Mian Qayoom lamented that Forces have become habitual of killing innocent people in Kashmir. “First they killed a civilian in Fathekadal, then a pregnant woman was butchered. In Trichal Pulwam, Forces let loose a reign of terror and even didn’t spare women. This is a naked form of terrorism. The Kulgam carnage was brutal and condemnable,” he told news agency CNS.Kashmir Chamber of Commerce and Industry while expressing resentment over the Kulgam carnage warned Government of India of stern consequences in case it doesn’t stop killing of innocent people in Kashmir Valley.KCCI members staged a silent protest in Kashmir capital Srinagar. The members were holding placards and banners seeking an immediate end to bloodshed.The protesting business community blamed security agencies for the mess and said that it the obligation of Forces to sanitize the area before allowing people to visit encounter site. They said that Kashmiris are being made to suffer under a well hatched conspiracy. 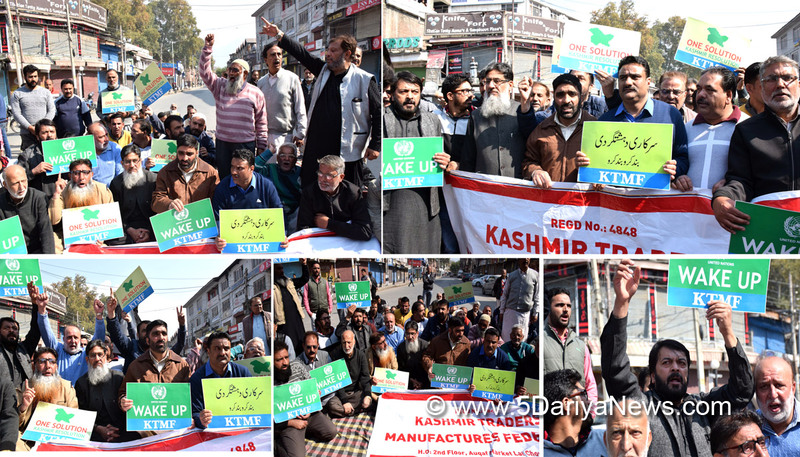 Kashmir Traders and Manufacturers Federation also staged a protest against the civilian killings in Kashmir.The business community staged a peaceful protest at Press Enclave Srinagar and later offered funeral prayers in absentia for Kulgam victims. The protesters demanded the withdrawal of army soldiers from Kashmir while accusing them of grave human rights violations.In South Kashmir’s Anantnag district, protest was held by Bar Association Anantnag and All Traders and Manufacturers Association against these killings. Lawyers from Bar Association while denouncing Kulgam carnage alleged that encounter site was not sanitized intentionally. The lawyers hold government forces responsible for the killings of civilians in Kulgam. They said that killings of innocent people have become a norm in Kashmir. “Every day people are being killed and the killers are never taken to task,” said lawyers.The traders’ community from the district who also staged protest said that bloodbath has become routine in Kashmir. They said Government of India is callous towards the sufferings of people. The traders impressed upon government of India to start an unconditional dialogue and resolve the Kashmir issue.